Vodacom, through the Vodacom Foundation Change the World programme, supports visionaries who want to make the world a better place. During Women's Month, we focus on women who are making a difference in their communities. The Vodacom Foundation Change the World programme aims to encourage and stimulate the culture of volunteering in South Africa. It gives participants the chance of a lifetime to work for a non-profit organisation (NPO) for a year, with Vodacom covering their salaries for the year. In the 2016/7 year, Vodacom Foundation hosted the seventh edition of the programme. More than 5 000 applications were received and 20 volunteers were chosen to fulfil their dream. They traded their regular day jobs to serve their communities with their highly sought-after skills. In the light of Women’s Day on 9 August 2017, we are highlighting three women who are making a difference in their communities. With the support of Vodacom, they’ve been doing big things this year. Chrissie Kritzinger works for iThemba Projects in Sweetwaters (Mpumuza), KwaZulu-Natal. This project aims to transform the younger generation in a positive way by educating and mentoring them to become change agents in their community. Chrissie’s project proposal for 2017 is to expand and facilitate non-centre-based programmes, and to enhance the work of iThemba’s Early Childhood Development Centre of Excellence. Based in the North-West, Lebo works for the Angels of Tomorrow Community Support Centre, which focuses on empowering and improving the quality of life of vulnerable women, children and youth in the community. This was her second year as a Change the World volunteer. In her first year, her work included improving the libraries infrastructure in the community - refurbishing and cleaning old classes, renovating a bus, building a log house and acquiring books. 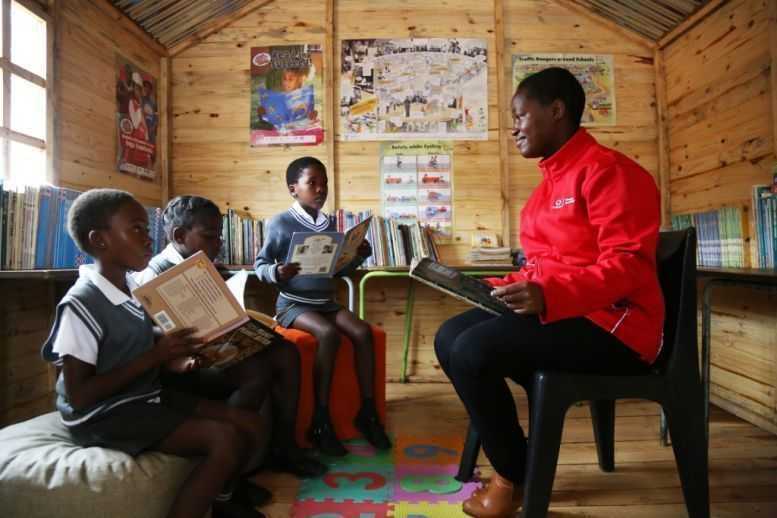 This year, Lebo was focusing on promoting literacy by giving children a space where they are stimulated through play, songs, storytelling and reading. In the schools where libraries are already established, she wants to establish reading clubs, and she also aims to train assistant librarians and continue with fundraising to ensure the librarians get a stable income. This year, Dignity Dreams in Gauteng welcomed Maselotsha Mphahlele to their team. This organisation distributes sanitary pads to young girls and educates them with age-appropriate talks regarding menstrual health. The project aims to distribute more than 100 000 packs of sanitary pads across four provinces, design and print booklets on menstrual health that will be included in every sanitary pack as well as expanding educational talks. The Vodacom Change the World programme is tackling a range of other issues that affect communities in South Africa by empowering community members. The message is simple: we have the power to change the world, and it starts with each of us. Apply here to join the programme. Applications close on 14 August 2017.